Northern Expressions Needlework: Like sparkles but hate metallic thread? I got in some swatch cards I'd ordered from Rainbow Gallery this week. I bought the cards for Splendor and Petite Treasure Braid since I love both and would like to use both in my designs in future. I'd forgotten how much I like the Splendor colours, they're very bright and vibrant, solidly dyed with no variegation at all. I like Splendor because I get awesome coverage down to 34ct with one strand. It's not expensive - about $3.50 a card, but you get so much on a card! They're 8 yards, 12 strands, so per yard it's very inexpensive. Probably not great if you only need it for five stitches, but if you're doing a lot of a few colours it's a good choice. The Petite Treasure Braid I love. It's much nicer to use than Kreinik's metallics and it does come in some really pretty colours! I don't think it's quite as many as Kreinik. It's also less expensive. A card is about $2.75 most places, however, you get 25 yards in comparison to Kreinik's #4 which is only 12 yards and retails for about $3. Anyway, to make a long story short (yeah, I know, too late), they also sent me a swatch card and a sample of their newest product, Petite Silk Lame Braid. It's not a new product, they've been doing Silk Lame Braid for years in thicker weights, which are mostly for canvaswork, and cross stitch on low counts up to 14. However, this year, they released the Petite version, which is suitable for cross stitch on 16ct (or 32ct over two) and up. It's similar in weight to the Petite Treasure Braid or a #4 Kreinik. What is it exactly? It's Splendor silk woven with a blending filament of the same colour. The result is a much more subtle sparkle than using a metallic on it's own. Similar to using a blended needle with a blending filament - just much less hassle. It's single stranded on the card, use it as is without separating. It currently comes in 26 colours but there are 22 more being released in January. It retails for about $3.50 a card and you get 20 yards on each card, so it's not terribly expensive, since you're probably not going to use it for huge areas and more as an accent thread. So what do I think? I absolutely love it. I test stitched it on 35ct and 40ct (both over two) to see how it would behave. It behaved beautifully. There was none of the twisting and tangling and knotting commonly associated with metallics. I used an approximate 18" length and only had to dangle the needle once or twice. It didn't come apart like many metallics do, and it didn't fray terribly either. It performed very well in fact. On the 35ct I used a #24 needle, and on the 40ct I used a #26 needle. It was a little bit of a squeeze getting it into the #26 eye (Bohin needle for reference) but it glided through once I did get it in there. Please excuse the obviously messy stitching - I am NOT an in hand stitcher, I absolutely hate it because I can't make nice neat x's that way. On 35ct it was perfect coverage, not crowded at all. On 40ct however... it's doable, don't get me wrong, I would definitely use it for small areas, but it is a bit of a tight fit. I would think it would cover nicely on 32ct as well, but I didn't try that out today. Maybe I will at a later date. For 14/28ct I would probably go up to the next weight, Silk Lame 18, because I don't think the coverage would be adequate. No matter what I did with the camera and scanner I could not get it to pick up the sparkle accurately, but it IS there, much more so than the pictures show. Overall, 2 big thumbs up. I will definitely be using this for new designs in the coming years, it's seriously wonderful stuff. November's Gift of Stitching magazine is now out, so I can show off pictures of my contribution finally!! 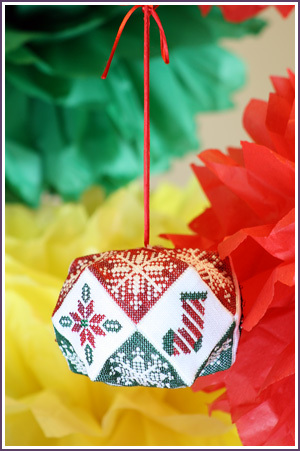 It's called A Northern Christmas Expression, and it's a 15 sided biscornu ornament. I stitched it in 2 colours of Gloriana Florimell - 1 thread over 2 on 32ct linen. Just a note - the coverage of one strand of this thread on 32ct is actually quite nice! I was very impressed. It also uses Petite Treasure Braid and 3 colours of Delica Beads, so there is lots and lots of bling on this one! I included a conversion to DMC, Kreinik and Mill Hill. I have to say, I was a little bit freaked when I was asked to do an ornament. I don't DO finishing. I'm not a sewer, I'm not good at it and I don't like doing it. However, the assembly for this was really simple. It was my first attempt and won't be my last. ETA - I made a mistake in the pricing of Petite Treasure Braid - it's MSRP is actually $2.75 not $3.75. Thanks for the hint about the Treasure Braid. Ironically, just today on my blog I complained just a teeny bit about stitching with metallics. I had finished up a project last night and was glad to put that thread away! The end result was nice though. Your info is appreciated! The end result IS pretty. The Treasure Braid is still fussy to use, but not nearly as bad as the Kreinik. One thing I find helps immensely with metallics is to use a bigger needle. I tend to use a #24 with them and they seem to come apart less.